Stephen Hawking, a British theoretical physicist who became a household name, died at the age of 76. 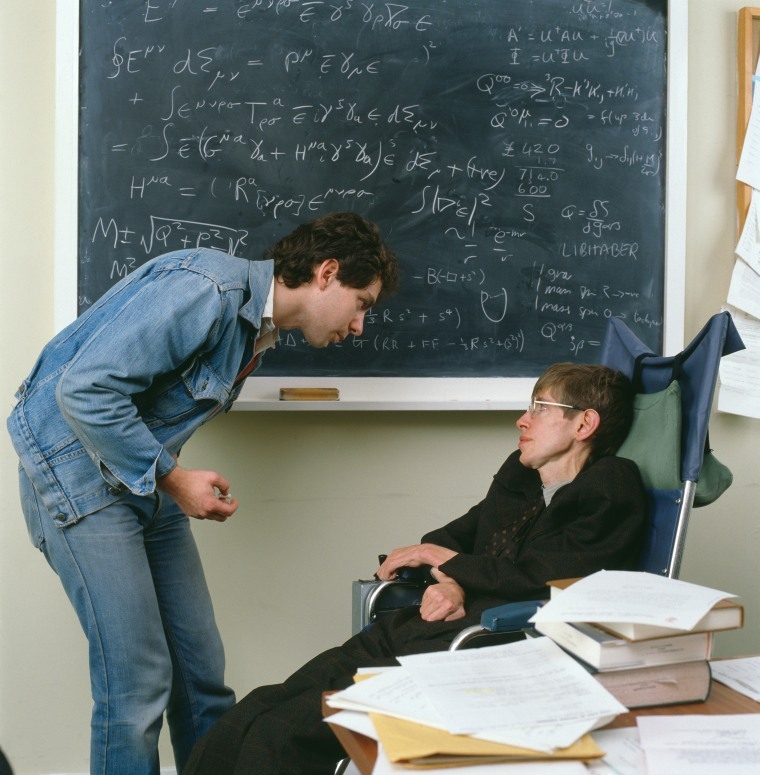 Stephen Hawking, seen here at Princeton University in 1979, died on March 14 at his home in Cambridge, England. 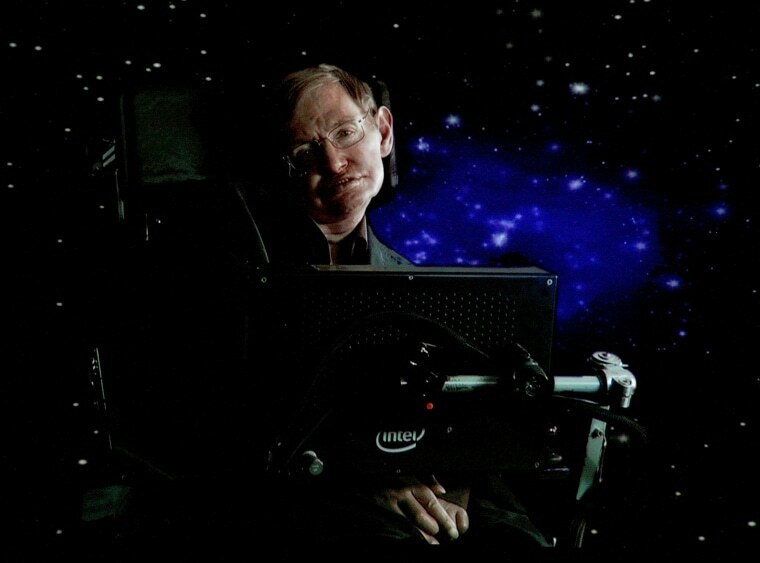 Hawking was as famous for his insights on black holes, the existence of God and quantum gravity as he was for his unique way of speaking while living his life in a wheelchair. Diagnosed at age 21 with amyotrophic lateral sclerosis, or ALS — also known as Lou Gehrig's disease — Hawking proved every doctor wrong as he defied their grim prognoses decade after decade again. 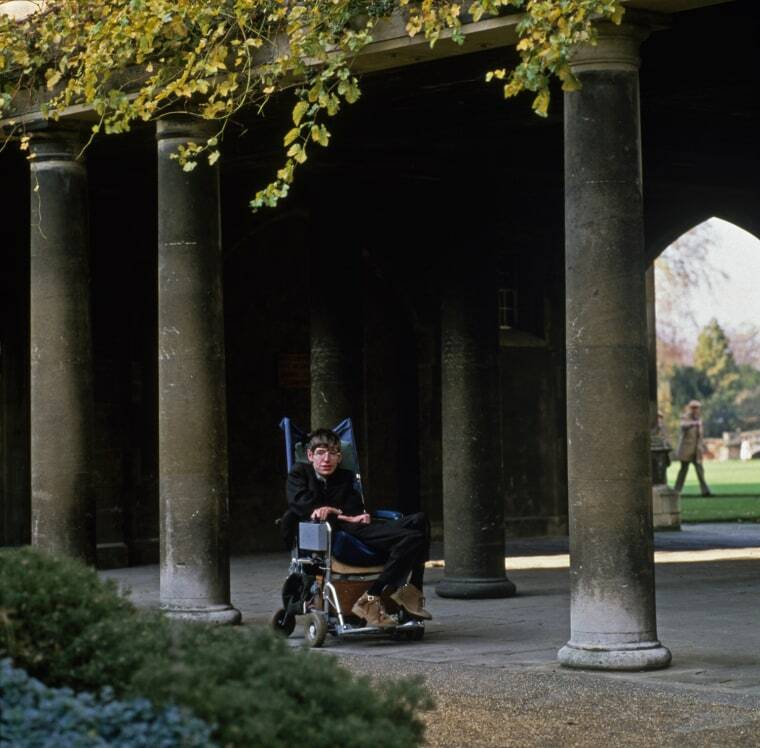 Hawking with student Chris Hull at Cambridge University in January 1985. 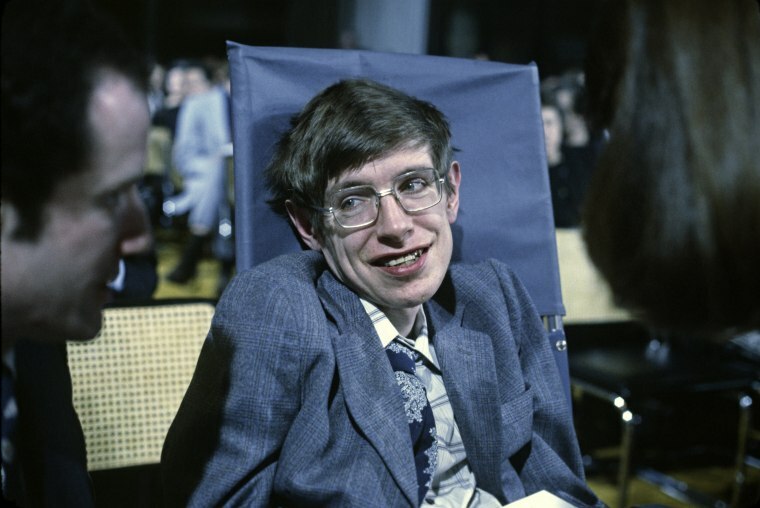 Hawking shot to international fame after the 1988 publication of "A Brief History of Time," one of the most complex books ever to achieve mass appeal, which stayed on the Sunday Times best-sellers list for no fewer than 237 weeks. Hawking makes a guest appearance on "Star Trek: The Next Generation," in 1993. Hawking became such a recognizable figure that he appeared as himself on "Star Trek" and his cartoon caricature appeared on "The Simpsons." 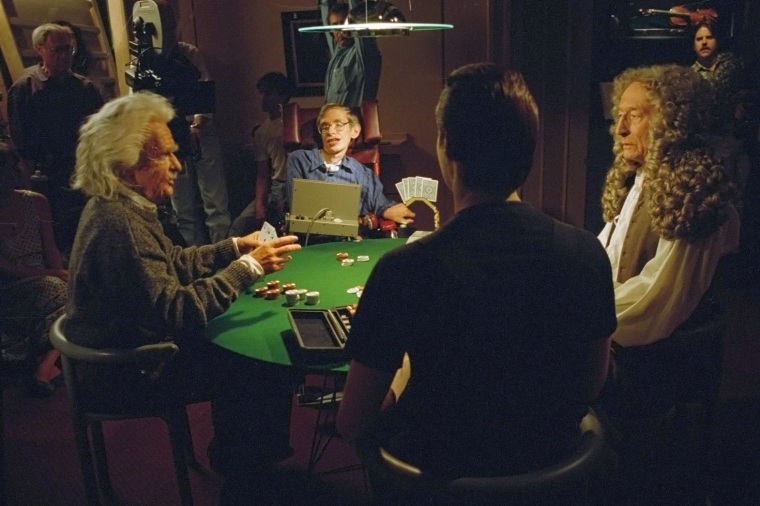 The "Star Trek" episode featured a scene in which the character Data, back to the camera, plays a poker game with a group of famous scientists: Hawking, Albert Einstein and Isaac Newton. 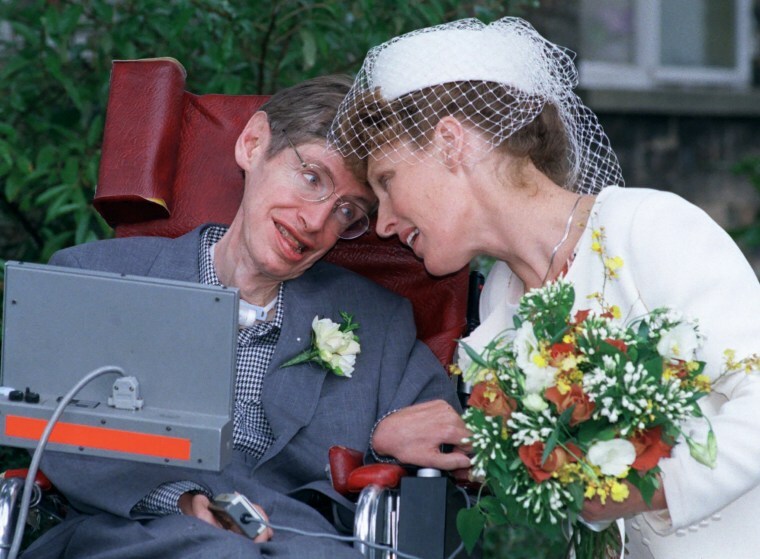 Hawking marries Elaine Mason at Shire Hall on Sept. 15, 1995 in Cambridge. Mason was his former nurse and her ex-husband David was the computer engineer who adapted the scientist's voice synthesizer so it would fit onto his wheelchair. 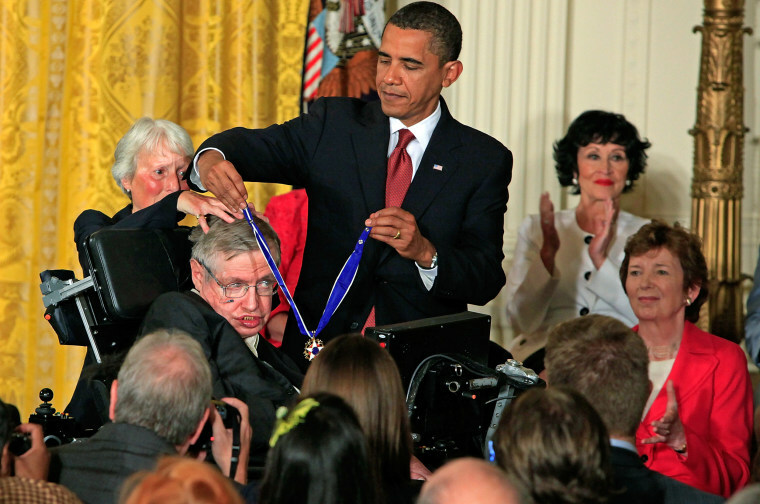 President Barack Obama presents the Medal of Freedom to Hawking in the East Room of the White House on Aug. 12, 2009. 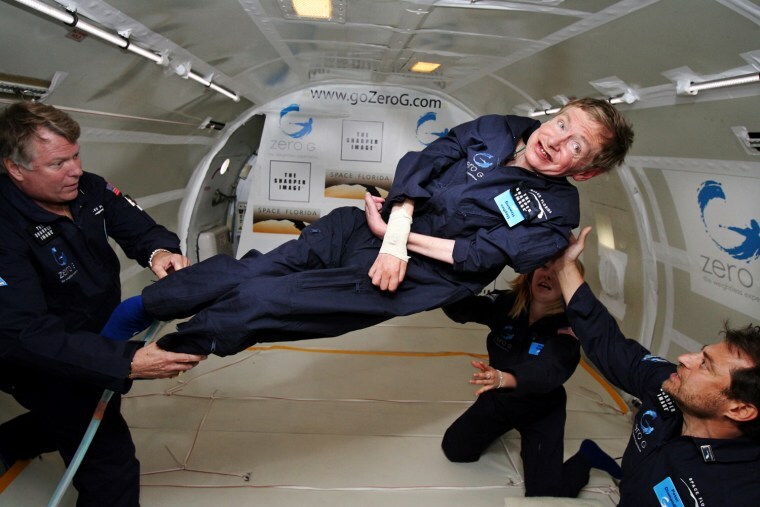 Hawking floats on a zero-gravity jet on April 26, 2007. The modified jet carrying Hawking, a handful of his physicians and nurses, and dozens of others first flew up to 24,000 feet over the Atlantic Ocean off Florida. Nurses lifted Hawking and carried him to the front of the jet, where they placed him on his back on a special foam pillow. The plane made a total of eight parabolic dips, including two during which Hawking made two weightless flips like "a gold-medal gymnast," said Peter Diamandis, chairman of Zero Gravity Corp., the company that owns the jet. Hawking with his daughter Lucy Hawking during a presentation at George Washington University in Washington, D.C., on April 21, 2008. Hawking speaks at the 2010 Television Critics Association Press Tour at the Langham Hotel on Jan. 14, 2010 in Pasadena, California. 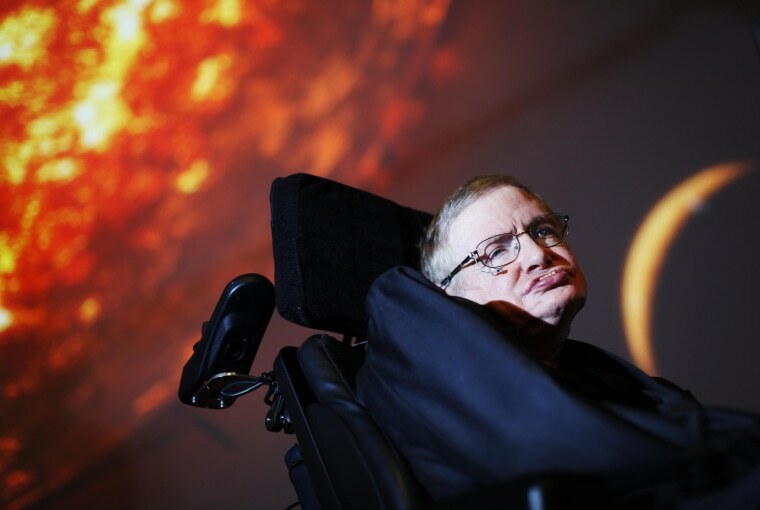 Hawking's formidable mind probed the very limits of human understanding both in the vastness of space and in the bizarre sub-molecular world of quantum theory, which he said could predict what happens at the beginning and end of time. 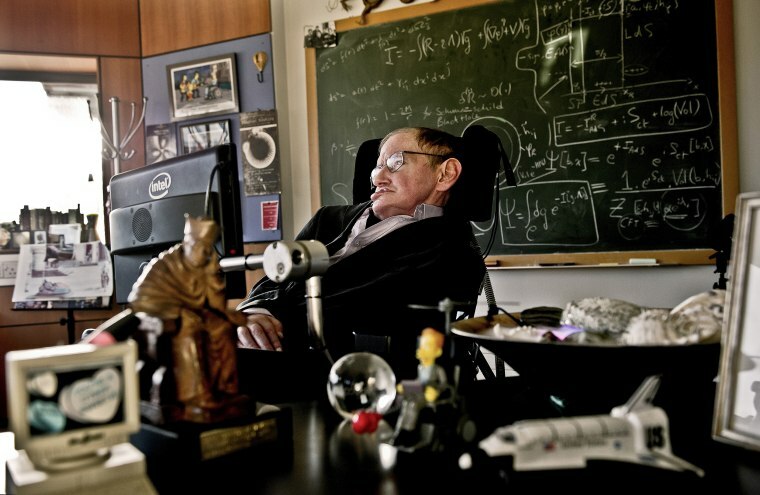 Hawking in his office at the University of Cambridge in December 2011. Hawking's "A Brief History of Time," seen on display at the Science Museum in London in 2012, is estimated to have sold 10 million copies in more than 40 languages. 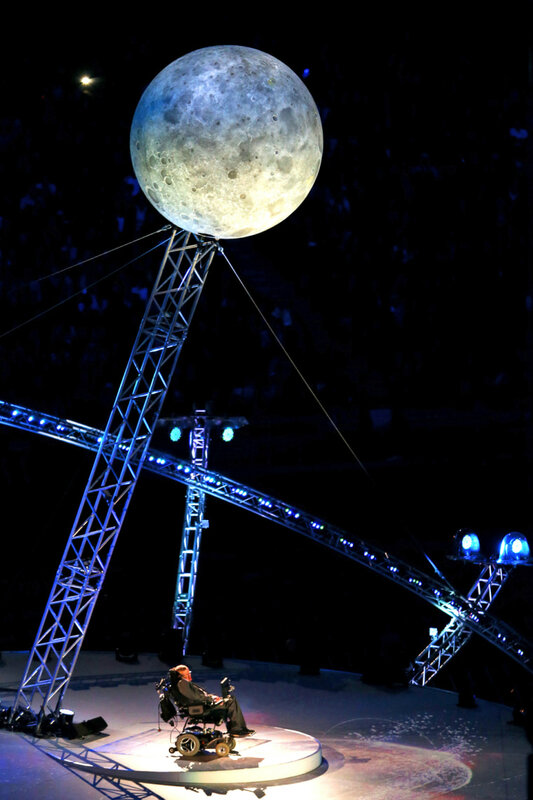 Hawking narrates a segment during the Opening Ceremony of the London 2012 Paralympics. Hawking attends a gala screening of the documentary "Hawking," a film about the scientist's life, at the opening night of the Cambridge Film Festival in England on Sept. 19, 2013. Britain's Queen Elizabeth meets Hawking during a reception for the Leonard Cheshire Disability charity at St James's Palace in London on May 29, 2014. Eddie Redmayne and Hawking attend the after-party for the EE British Academy Film Awards on Feb. 8, 2015 in London. Redmayne gave an Oscar winning performance as Stephen Hawking in the film "The Theory of Everything." 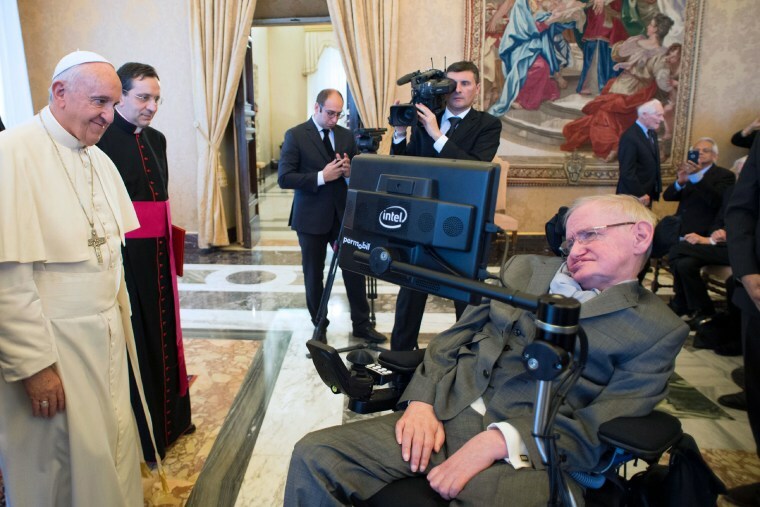 Pope Francis meets with Hawking at the Vatican on Nov. 28, 2016. 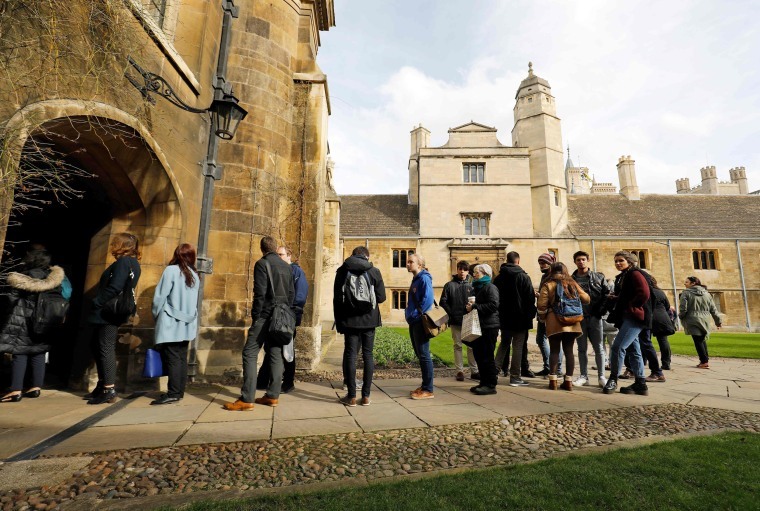 Students wait to sign a book of condolence at Gonville and Caius College, where Hawking was a fellow for over 50 years, at Cambridge University on March 14, 2018.